MOUNTAIN VIEW, Calif. – December 15th, 2004 – The Mozilla Foundation, a non-profit organization dedicated to preserving choice and promoting innovation on the Internet, today announced that it has placed a two-page ad in the December 16th edition of the New York Times. 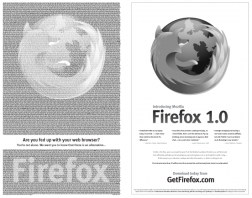 The ad, coordinated by Spread Firefox, features the names of the thousands of people worldwide who contributed to the Mozilla Foundation’s fundraising campaign to support last month’s highly successful launch of the open source Mozilla Firefox 1.0 web browser. Spread Firefox is the volunteer-run Mozilla advocacy site, with over 50,000 registered members, where community marketing activities are organized to raise awareness and to promote the adoption of Firefox. The Spread Firefox site is powered by the open source CivicSpace web site software. Community members may submit ideas and join volunteer teams by visiting http://www.spreadfirefox.com. 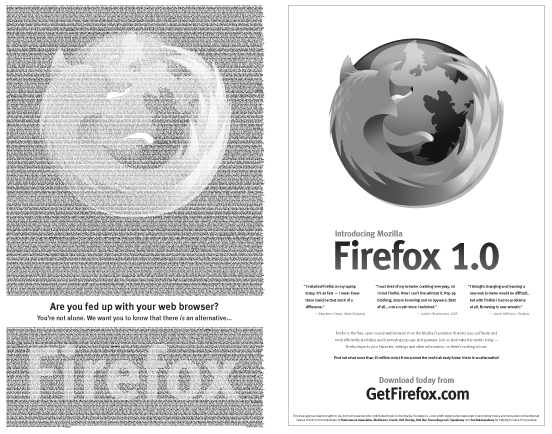 The design and development of the New York Times ad was led by Christopher Messina, a San Francisco-based designer and a volunteer leader at Spread Firefox. To date, Firefox has been downloaded by over 11 million people worldwide. Established in July 2003, the Mozilla Foundation is a non-profit organization hosting a collection of leading innovators whose mission is to preserve choice and innovation on the Internet. The Foundation provides organizational, legal, and financial support for the Mozilla open source software project. The Foundation is based in Mountain View, California and is the heir to the legacy and tradition of the Internet’s first widely used browser, Netscape. Learn more about the Mozilla Foundation at http://www.mozilla.org.